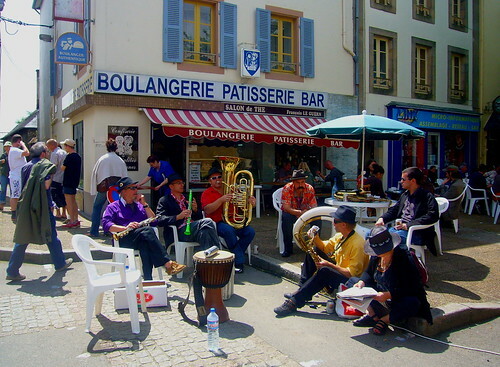 Best known for its annual music festival, Carhaix in Brittany was a 2011 Tour de France stage town. Wendy Mewes has this guide to the area. Carhaix is best known as the venue for the Festival des Vieilles Charrues (in French), a music extravaganza usually held in July, and Brittany’s answer to Glastonbury. The current mayor Christian Troadec, a controversial figure and outspoken Breton regionalist, is one of the founders of the festival, and largely responsible for putting Carhaix back on the map. In previous times, the height of Carhaix’s fortunes were in the Roman era when under the name Vorgium it was a focal point of communications, with main roads linking it to all parts of the region. Excavations in recent decades have revealed many remains from this period, including evidence of the aqueduct which brought water from 27km away to feed the fountains and private pipes of the town. The theme of connections was echoed in the 19th century when Carhaix became the hub of the Reseau Breton, a metre gauge railway network. Five routes went out from here: to the west coast at Camaret, south to Rosporden, north to Morlaix and Guingamp and east to La Brohinière on the way to Rennes. Many people were employed in the workshops and maintenance sections in Carhaix, and these railway workers became a tight-knit unit, living in the same area of the town. From their number, the first Breton music band (bagad) was formed in 1947, a development that went on to contribute much to the revival of Breton culture, especially in the 1950s and 1970s. The famous soldier Theophile-Malo Corret, known as La Tour d’Auvergne was born near Carhaix and is commemorated in the town. He fought in the American Wars of Independence, and the French Revolutionary armies, where he was honoured by Napoleon as Premier Grenadier de France. He was also a historian and scholar of Celtic languages. Carhaix is not a particularly scenic place, but there are exceptions, such as the Petit Carhaix area by the river Hyères, and the streets around the Church of St-Trémeur. Near the latter is the excellent tourist office (tourismeCarhaix@wanadoo.fr; +33 (0)2 98 93 04 42), housed in the finest building of all, the 16th century Maison du Sénéschal. An even older edifice is the Church of St-Pierre de Plouguer, which in small part dates back to the 11th century. Otherwise the town is ringed by industrial estates and out-of-town shopping places. The brewery making the excellent range of Coreff Breton beers moved from its Morlaix home to Place de la Gare, Carhaix a few years ago. Visits can be arranged via their website, or ask for their wares by name in any bar. Carhaix is a great base for a cycling holiday with easy access to the Brittany's green ways network of old railway lines and canal towpaths. Brittany's Green Ways: A Guide to Re-Used Railway Tracks and Canal Towpaths (UK, US) has full maps and details of all the existing routes. From Carhaix the V7 route goes north to Roscoff and south to Rosporden (128.5km). The V6 goes east for 121km to St-Méen-le-Grand. The western extension of this to the Crozon peninsula has yet to be fully developed. The Nantes-Brest Canal (3km south of Carhaix) offers 365km of easy and scenic cycling. It opens the way to interesting places like Châteauneuf-du-Faou, a pretty town perched on high above the river Aulne, and long-distance travel right across Brittany. See The Nantes-Brest Canal guidebook (UK, US) for more. The Monts d’Arrée, Brittany’s highest hills, are not far away, with miles of tracks with great views to explore. This area can be combined with a visit to Huelgoat where the beautiful forest contains a remarkable granite ‘Chaos’ of gigantic boulders tumbled into extraordinary shapes. There are great walks here, too: along a tiny former industrial canal out to the old lead/silver mines or up to Arthur’s Camp (actually an Iron Age fortified place). For bike hire in Brittany, see our bike rental listings. Carhaix is at the junction of various main roads. The N164 links it directly to Rennes (142km). It’s only 59km from the ferry port at Roscoff (from Plymouth). St-Malo is a bit further at 123km. See our ferries to France section for more information and links. By train, change from the main TGV line (Paris/Brest) at Guingamp. See voyages-sncf.com for train times and ticket prices. See also our information on taking bikes on French trains. The most popular place to stay is the two-star Noz Vad hotel, well-situated for restaurants and the centre. It also has a friendly bar and hosts exhibitions. Just outside the centre is the gorgeous Manoir de Kerlédan, where Peter and Penny Dinwiddie offer outstanding B&B. Check here to search for other accommodation in the area, including hotel, gîte, B&B, self-catered and campsite options. There are quite a few places to eat in the town centre, but highly recommended are La Rotonde (1, Place Droits de l’Homme; 02 98 93 30 41) which has good Breton food and welcoming staff, and the restaurant at the bowling centre which is rapidly getting itself a reputation for great value-for-money nosh (Bowling de Carhaix, Persivien; 02 98 93 03 20). Brittany's Green Ways: A Guide to Re-Used Railway Tracks and Canal Towpaths (UK, US, Fr) is an invaluable guide, as is The Nantes-Brest Canal guidebook (UK, US), a guide for cyclists and walkers. Michelin has a regional Brittany map (UK, US), as well as a green guide to Brittany (UK, US). IGN also has a regional map of Brittany (UK, US, Fr). The IGN site also carries dozens of more detailed maps covering every corner of Brittany and its departments, including Carhaix-Plouguer map. In the UK, Stanfords bookshop has an excellent range of Brittany books and maps, including hundreds of IGN maps. See also Wendy's Freewheeling France guide to cycling the Nantes-Brest Canal, as well as her history of the Nantes-Brest Canal. She's also written a regional overview of Brittany, and guides to Brest, Rennes, Quimper and Vannes.